Simon Goodwin looks at the likeliness of LOKI, introduces a 97p lightpen to the Spectrum, chases Cheetah, reviews The Code Machine and Spectrum technical books, disables BREAK and dispenses sundry tips! Whatever plans Alan Sugar may have for the Spectrum, you can rest assured that the much trumpeted ‘Loki’ project is not among them. I’ve had a few letters from readers asking about the rumoured Sinclair Megamachine. By now many of you will have read hysterical comments in various comics, so it’s probably time TECH TIPS sifted the gist from the gibberish. The story so far... as Sinclair Research slid towards bankruptcy, sundry brains were invited to dream up a wonder-product that would rescue the firm from extinction. It was obvious that the existing projects would not be enough to save Sinclair. Besides the 128, launched in a desperate bid to stave off creditors early this year, these projects included a kind of Quantum Triple Jump follow-up for the QL, which had to re-use all the old parts to save money, and a portable machine called Pandora which was handicapped by the fact that it needed a display that stubbornly refused to work despite six years of development effort. Since the sale of Sinclair’s computer business Amstrad have turned down the chance to market Pandora, and Sinclair have — at last — given up on the display. A list of really new possibilities was made, including an IBM Personal Computer clone — which may have attracted Mr Sugar’s attention given his intention to enter this sector of the market any day now — and a cut-price version of Commodore’s Amiga — code-named ‘Loki’. If nothing else, leaked details of those projects might have helped Sinclair to stave off the demands of creditors for a while longer. But as we know, Timex, Thorn EMI and Barclays Bank didn’t wait; they chose to over-rule the management at Sinclair and force the firm to sell out to Amstrad. It is not clear whether or not anyone at Sinclair was aware that Loki was the name of an epic liar, epitomised in Nordic legends — in any case, the coincidence of the names seems to have passed by other magazines. Here at CRASH, where we spent a while trying to play Valhalla before we reviewed it, we spotted the name from that game. Anyhow, being blessed with lots of headed typing paper and very little money, the Thinkers at Sinclair were invited to make a big list of trendy computer features. That list, embellished with a few charts and tables but a noticeable lack of circuit diagrams and real detail, finally escaped into the hands of the computer press. Despite six years of agonising experience of the difference between Sinclair specifications and reality they swallowed it whole. Technical know-how has never been a strong point in magazines that still — indeed, the same month — print Commodore 64 screen shots in their Spectrum software preview section. The fact is that the proposed machine would take literally years (plural) to build, at a cost of millions. It has taken four years for a single-minded, well-funded firm, led by Jay Miner — designer of the Atari 800, and several sophisticated Atari coin-op arcade machines — to develop the Amiga. Relatively little of that time, you can be sure, was spent writing the specification. When the Loki ‘exclusive’ appeared I spoke to an ex-Sinclair designer. He hadn’t heard of the project — ‘dreamware’, he called it — and poured scorn upon the suggested price of £200. Even if the machine could sell in the vast quantities needed to repay the development costs (and the interest on the money borrowed to support that level of production), it couldn’t be made, packaged, distributed and sold for £200. Remember, this isn’t just a machine with ‘Amiga graphics’ and ‘Fairlight sound’. It also boasts a fully-buffered expansion bus, RGB, composite and TV display outputs, a serial port, two joystick ports, a light pen (supplied), three different types of MIDI (musical instrument) port, stereo (sampling) sound in and out, a headphone socket, and a video recorder/video disc interface. If that’s not enough you can plug in a floppy disk, hard disk, compact disk, mouse and modem as ‘extras’. See what I mean about a shopping list? “What! No Microdrives?” I hear you cry. When it comes to costing this sort of thing it’s not just a matter of flicking through a few catalogues and adding up component costs. No one can work out a firm price on the custom chips intended to go into the Loki, as they’ve not been designed, let alone tested and fabricated. We’re talking about very large, very fast components — chips with about eight times the power of the Spectrum’s (none-too-reliable) ULA. A 7MHz machine, with 52K of video memory and an asynchronous graphics processor could not use standard, cheap, RAM chips; you’d have to use the scarce and expensive 64K by 4 components which are one of the reasons for the high price of the Amiga. There are unconfirmed rumours that Amstrad may have obtained some options to use the Amiga chip set. These tales may be true, and it’s certainly possible that Amstrad maybe in the running for such rights if Commodore was forced to sell. But the Amiga chips rely upon the 16 bit bus of the 68000 processor, and there’s no practical way to use them in a Z80-based Super-Spectrum. In any case, the ‘details’ of Loki appear to have come from Sinclair, not Amstrad. THE LOKI — A SUGAR COMPUTER? Guaranteed free from artificial press speculation it is not... Full of Monosodium Glumate rather than Silicon, this version of the LOKI is exclusive to CRASH. Now it’s been photographed, the ‘computer’ has been consumed with the aid of Roger ‘Gannet’ Kean. But do not despair! You too could own a specially commissioned CRASH LOKI. All you have to do is come up with another name for the Speculative MegaSpectrum. 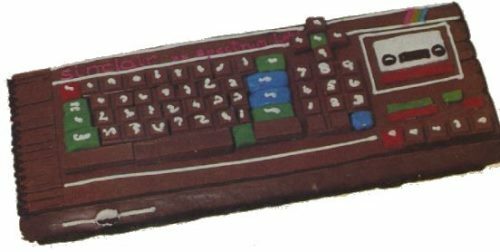 Send your suggestions in to LOKI COMP, TECH TIPS, CRASH TOWERS Best name wins its sender a scrummy chocolate comestible (LMLWD) like the one in the picture. Burp! It may be fun to dream about Loki, but the fact is that it won’t appear, and nor will anything like it. All we can look forward to is Amstrad’s Spectrum Plus 2 — the 128 with a cassette recorder “glued on”, to use Mr Sugar’s own phrase — and, very likely, a dirt-cheap Spectrum games console this Christmas. But don’t despair — we’ve yet to see everything the humble Spectrum can do, and we’ve hardly explored the possibilities of the 128 at all. Don’t believe all you read, even in CRASH!